Karen Andersen – Art that makes you smile. When a piece of art literally makes you smile every time you look at it you know you’re onto a good thing. I have been searching high and low for beautiful art to fill my house recently, my wish list is big but unfortunately my budget is not. 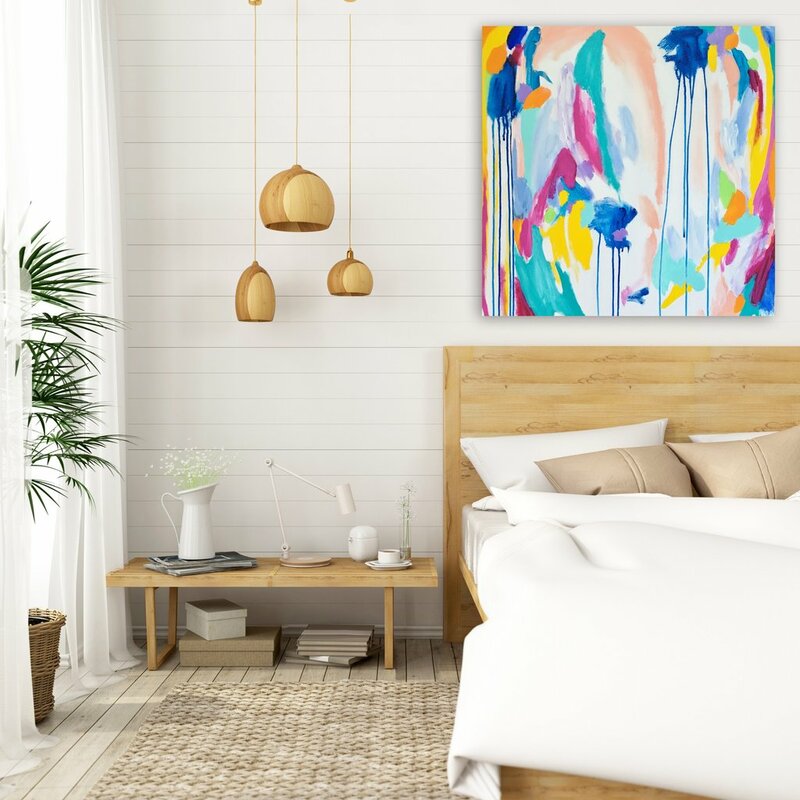 Even spending a few hundred dollars on a piece of art can be a big decision, but it can also be an investment. Choosing to buy an original painting from an up and coming local artist can be a very smart move, and definitely a choice I wish I had made many times over. I have wanted to buy pieces from artists at the beginning of their career in the past, I have taken far too long to actually buy it and then their prices double, triple and quadruple due to their high demand. Moral of my story, If you see a pice of art that makes you smile and it’s within your reach, grab it! Which brings me to the gorgeous new painting hanging in my home. 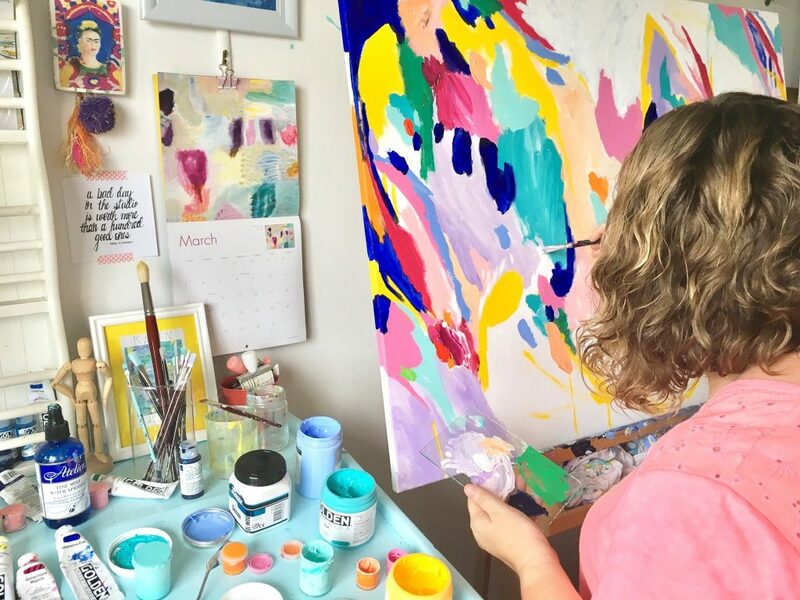 It is from a local abstract artist who is fairly new to painting and is starting to be recognised by her peers as somebody to watch. She recently won second place with her ‘Coral Sea Garden’ painting in the Hidden Wonders Art Exhibition at the Hervey Bay Regional Gallery. Karen working in her studio on the Fraser Coast. You know I’m a big sharer, ok, maybe an over sharer, but I thought you might appreciate learning a little bit more about Karen and her art. I am a fine artist, working with acrylic paint and pastels to create lively, brightly-coloured abstract paintings. I am 41 years old and I live with my partner David and two teenage children (my son is 15 and my daughter is 13) on the Fraser Coast in southeast Queensland, 3 hours north of Brisbane. We own a 1960’s era four bedroom Queenslander that we are in the process of renovating (HUGE job!) and I love to fill it with vividly coloured homewares and art. 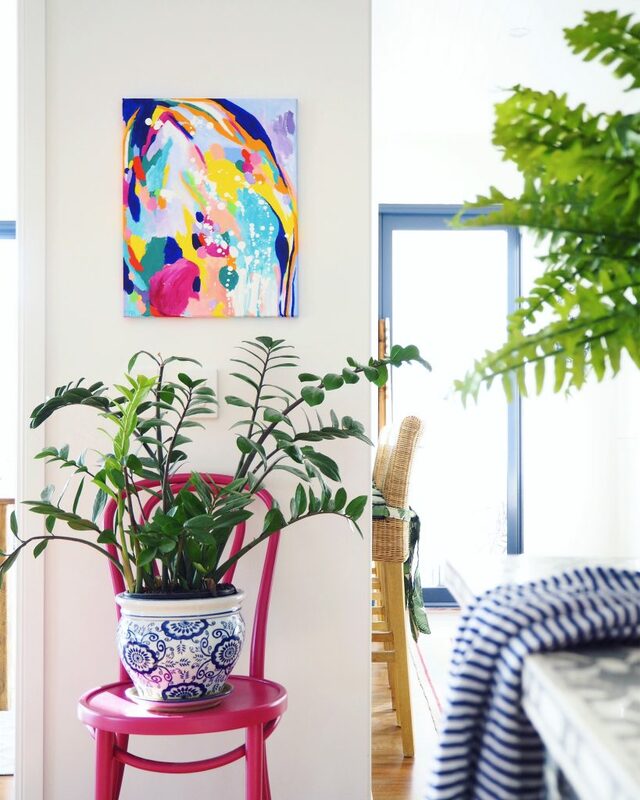 I feel very lucky to have my art studio in our home too – it really is my happy place, filled with light, art and glorious colour, where I can create until my heart’s content whenever inspiration strikes. What age did you start painting? I have always painted and drawn. Art-making was an integral part of my childhood and was my most favourite activity (apart from playing with my Barbies and going to the beach). It wasn’t until high school though, around the age of 12 or 13, that I became absolutely and totally besotted with art. I loved the work of Ken Done, Picasso, Matisse, the Post-Impressionists, and the artists of the Fauvist Period for their use of colour. I would spend hours studying their styles and composing my own (mainly abstract) paintings at home. Creating abstract art was never encouraged at high school by the time I progressed into Year 11 and 12, and though I loved to draw in realism, I could never shake the discontent I felt at having to paint objects and scenes for assessments that were completely uninspiring to me. Disillusioned at the thought of spending 3 years at university doing the same if I was to go on to do a degree in Fine Art, and choosing to focus on a less risky career option (in biological science), I pushed any thought of having a career as an artist to the furthest reaches of my mind. I busied myself with life and put my art on the back-burner, drawing and painting here and there throughout adulthood, but depression, anxiety, and low self-esteem saw that I never let myself entertain the thought that I could be a professional artist. It wasn’t until October 2016, at the age of 40, that I finally allowed myself to chase my artistic dreams. I began painting every day and the rest, as they say, is history. Were you surrounded by art growing up? Does anybody in your family paint? No one else in my family painted when I was growing up, but I was instead surrounded by very creative family members. My maternal grandmother was an extremely talented dressmaker by trade while my paternal grandmother was a champion cake decorator, baker and farmer who loved crafting with fabric and yarn. My dad is a carpenter and builder, very perfectionistic in his work. My mum has been crafting since before I was born – she sews clothing, quilts, accessories for her home and soft toys; she also crochets, knits, and enjoys scrapbooking and card-making. Mum has dabbled in many other crafts over the last 40 years and recently she has taken up art journaling and painting. She and I tend to heavily influence each other’s creativity and enjoy crafting together as adults, so I am not surprised that she has developed a fondness for art of late. Anyway, I digress. I spent an inordinate amount of time watching my grandmothers, my mum, and my dad creating as I grew up. Everything about the process each of them followed in order to make something with their own hands was absolutely fascinating to me. I was encouraged to join in too and would often complete little projects with them. There is no doubt in my mind that growing up in such a creative family has been pivotal to me developing such a passion for creating too, and I dabble in a few different crafts myself as an adult, but I do believe that my overwhelming passion for art has arisen primarily as a result of my lifelong obsession with colour. The great Impressionist painter Claude Monet is quoted as saying, “Colour is my day-long obsession, joy, and torment”. That is precisely how I feel about colour too. As a child, even when I was as young as 2 or 3 years old, I remember feeling obsessed with the colours in my books, on TV, in the environment around me. One of my most favourite things to do was to lay all of my pencils or crayons out in rainbow order. I adored rainbows – seeing them, creating them, and wearing rainbow-coloured clothes. There was something about looking at groupings of bright colours, observing the way that they played against each other, that always made me feel happy and alive. I still feel exactly the same about colour today. It features heavily in my art, my home, and my wardrobe. I live colour, I dream it. It is such a source of happiness for me. Colour is also a torment however as I can never get enough of it – I am always looking for that ideal new colour combination to use in my paintings, that perfect way to lay colours next to each other on a canvas. 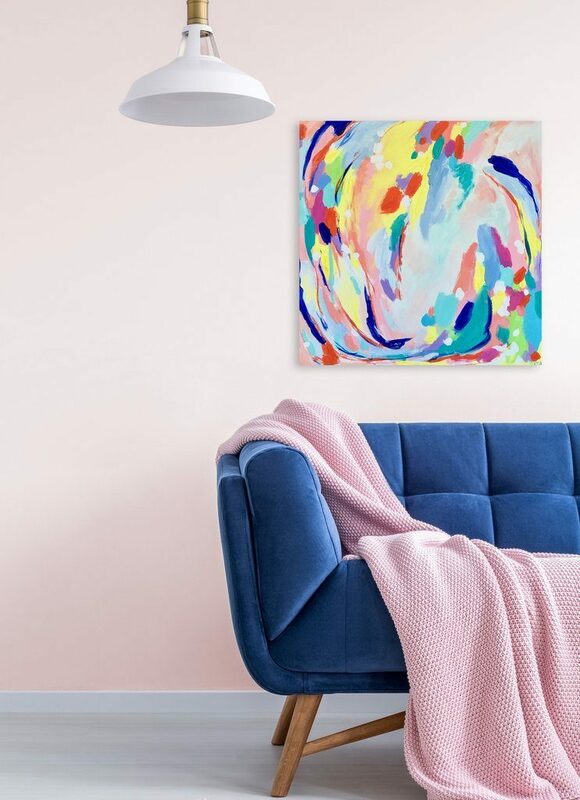 Colour is certainly the primary inspiration behind my work and the search for new ways of representing it in my art will forever push me to create fresh paintings. I am also heavily inspired by living in Queensland…our climate, our lifestyle, and our seemingly endless Summers. Being at the beach, watching the sea, walking in the waves as they lap the shore…it feels like home to me. I feel blessed to have the picturesque beaches of Hervey Bay, Fraser Island, Rainbow Beach, and Noosa North Shore so close to home and I visit all often with my family. I have always loved to be either on or in the water, so our coastal waterways and river systems are very inspiring to me too. Our natural environment is a huge influence on my work – our eucalypt bushlands, rainforests, coastal and marine ecosystems, the Great Barrier Reef, and all of their inhabitants – encouraged by conversations with my Dad (a nature lover) and university studies in biological science. It is my feelings about all of these elements that I endeavour to express my through my abstract paintings, through the use of colour and mark-making. Your love of colour is evident in your art. Do you start a painting with a colour palette in mind or do you see where the art takes you? Yes, colour most definitely informs the decisions behind how I start my paintings. I always begin each painting by choosing a colour palette that represents either the inspiration in general or how I feel about it. For example, recently I painted a piece about how I feel about being on Seventy-Five Mile Beach on Fraser Island, about what it feels like to stand and watch the waves splash and tumble, so I chose a palette heavy in blue, aqua, and turquoise, accompanied by drips and splashes of white. 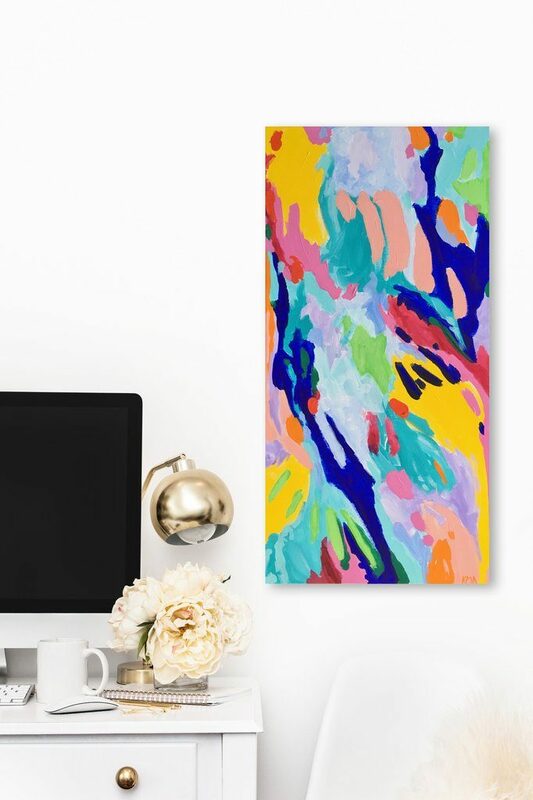 I also recently made a painting about my love of the Great Barrier Reef which features a palette of rich vibrant colours, bathed in an ultramarine background. My favourite technique is to use bold colours against more sorbet or pastel tones for maximum contrast and impact. Colour is always the element which is foremost in my mind when I am planning and constructing a painting and is essential in conveying my feelings about the painting’s inspiration. Your paintings make me smile. It must feel great to know your art has such a positive effect on people’s emotions? Awww, thank you so much Hayley – it’s lovely to hear that my work has such a wonderful effect on you! That is what I aim for in creating my paintings – for people to feel happy when they look at them. Knowing people love what I create certainly forms part of the reason why feel so compelled to do what I do. My work always comes from a place of absolute joy and from a deep passion for art-making, for colour, and for the things which inspire me. I endeavour to communicate those feelings through my work, so when someone tells me that they love my paintings or that they make them smile or feel happy, I always feel unbelieveably excited, proud and content. Oh yes! Iconic Australian artist Ken Done is my absolute favourite artist. I first saw his work at the World Exhibition (Expo88) in Brisbane in 1988 at the age of 12. I remember standing in front of those huge letters that he painted that spelled the word “AUSTRALIA” feeling in absolute awe of such a marvellous creation. I couldn’t believe that I had found someone else who very obviously felt the same way about colour and pattern as I did! I’ve followed his work ever since, with my favourite pieces of his being his beach and reef-themed works. In October 2016 I had the opportunity to see his work in person, to meet him, to seek some advice fom him, and to take an art class with him as part of his exhibition of reef paintings at the Rockhampton Art Gallery. The collective experiences around the Ken Done exhibition last year became a turning point in my life and formed the catalyst behind my decision to finally chase the dream I had held deep inside since I was a teenager – to be a professional artist. Where would you like your art to take you? I have so many artistic goals I want to fulfil! I would dearly love to have a solo exhibition of my work one day. I can just imagine how it would feel to walk into a gallery and see all of my work hanging on the walls! I would also like to use my art somehow to increase public awareness and decrease the stigma that exists around mental illness. I have suffered from anxiety and depression for as long as I can remember, and I know many other people and artists who suffer mental illness, so this is a cause that is very important to me. Like many other artists, ultimately I would love to be able to make a good living from my art eventually. In the short term though, my goals are to keep exploring and experimenting with art-making, to keep producing new work, and to continue sharing it in exhibitions and online. I’m very excited to see what lies ahead for my art! I think when you get to know the person behind the painting you can understand where the colours, passion and mood comes from. I feel connected in a way that I wouldn’t if I didn’t know anything about the artist. This is my painting titled ‘Coastal” in it’s new home, on the wall between my dining room and bar. I hung it where it will be seen everyday and make me smile. Pop over to Karen’s website HERE and see if her paintings make you smile too. If they do, grab one for yourself, you won’t regret it! 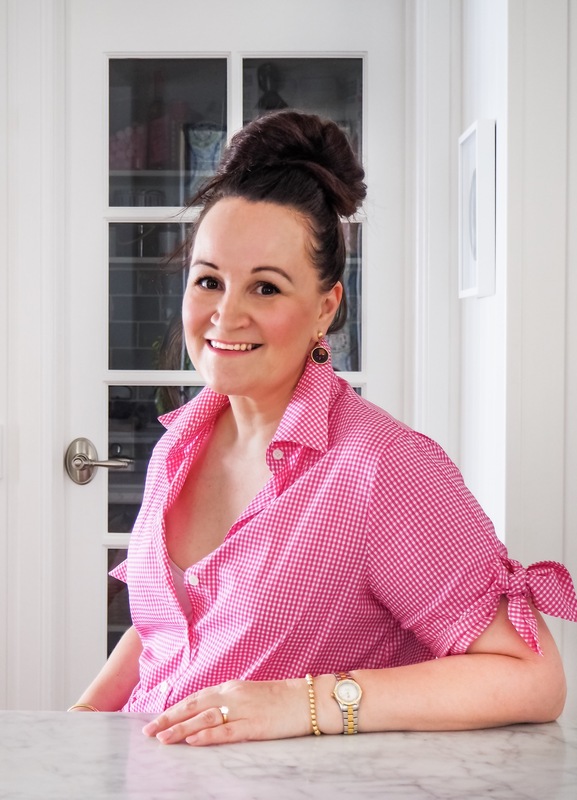 Karen is offering all my readers 10% off until the 25th May with the code MUMLITTLE10. Be quick, they are all original pieces and once they are gone they are GONE! How I wish that I had a few spare dollars to by “Whitsundays” what a magical piece, and from my region as well.